Hi guys!! This is my attempt to get more active on the forums since I bought my FD and have settled down since returning from overseas. So the issue I was having with my car after the first month was that it was running insanely rich, to the point where my co-workers would regularly complain about the smell of gas (and premix) while we were leaving work. After a few mountain runs, my friends were amused at how much flames my car spit out, but on the inside I knew this wasn't optimal. And it's only boosting .4 bar, which pisses me off!! So I took it to El Paso to get a tune. After talking to the tuner and the technician, they decided to do a compression test before hooking it up to the dyne. Here are the results. My problem is that the PO claims that the engine was rebuilt in September. The car runs fine, there's no signs of the engine going as far as I can tell (other than the frequent flooding due to low compression). I have since bought a 2nd car as a daily driver and I'm considering letting my technician do the rebuild and single turbo conversion. It's not in dire need of a rebuild, but if I can't tune it, is it worth starting from scratch? If you trust you mechanic/tech do the rebuild. The compression test has to be done correctly. If you have compression of 70's, your engine is due. If you do a rebuild, do single turbo conversion while you are at it. All relies on your trust on your mechanic and his competence. If you have doubts, shop around..
Was it done with a rotary compression tester? A motor with low compression won't start as easily, will be lacking in low-end power, may stall, etc. Also the running rich holds true as well. The motor being recently rebuilt doesn't mean much, you can put most anything together and have a motor that will start, run and drive but won't be the tightest or longest lasting motor. Would be nice to have a compression test with a proper rotary tester to make sure, but the evidence backs up the claim. Big thing here is to take your time and evaluate how you want to remedy the problem. There's doing it yourself all the way up to shipping it to a rotary shop with a blank check and lots in between. Big thing is there is no end of money you can spend on an engine, be realistic and set a vision for what you want. Regardless keep that CYM on the road and happy! The test with done with a Mazda Rotary compression tester. He even did it a 3rd time to demonstrate how to do it and verify the numbers. Thanks for all the replies guys. I’m waiting on the estimate with the parts list and final prices for everything, including the single turbo conversion. Best believe I will do what it takes to keep her on the road. Waited 7 years to get this car. Last edited by IceMan1990; 07-09-18 at 04:59 PM. What was the RPM reading for those numbers and what is your elevation? Was the throttle held open during the test? I have seen plenty of falsified compression tests. Last edited by Banzai-Racing; 07-11-18 at 06:27 AM. I’m not certain of the RPM numbers but the test was done in El Paso, TX. According to a few of the rotary guys in Albuquerque, the symptoms I’m having are in line with a low compression motor. No low end power, problems on hot starts, constant stalling, and frequent flooding just to name a few. I believe Iceman you misunderstood the two posts from two other very knowledgeable members. As I understood it, they did not believe that the shop that did your compression test purposely falsified the test. 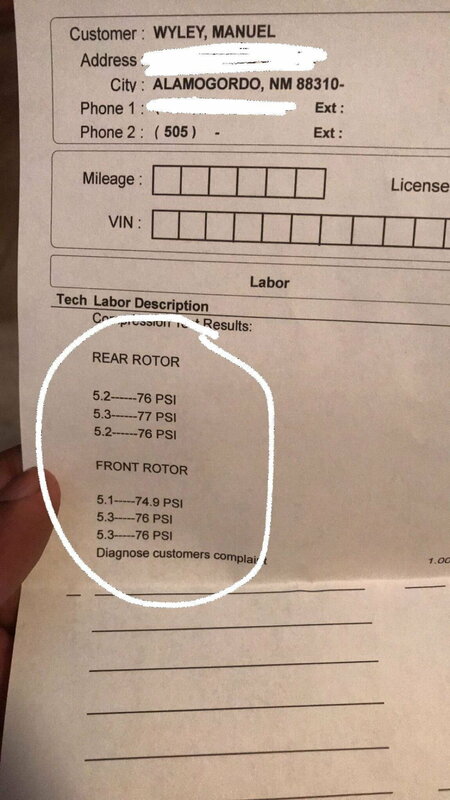 They were just pointing out that if the test is not done a certain way for a rotary engine, even with a rotary compression tester, the compression reading will be incorrectly low and the test is inaccurate or false. I don't think you would want to rebuild your engine if it wasn't needed. The two posters are trying to save you time and money in pointing these things out. That's all. For example, if the throttle isn't held open during the test the compression values will be artificially low simple because the butterfly valves are obstructing the intake. Likewise if done in Denver (or El Paso) you'll get a much different value than I will here in Dallas which is a mere 600ft above sea level. Likewise I would expect a different value than in Pensacola. Really even readings across all 6 faces, you wouldnt see that on a crapped out engine too often. might just need a tune. Additionally if the rpm was 175rpm the reading must be normalized to 250rpm which yields much higher results. Weak battery, high altitude, closed throttle all effect readings. All of your symptoms also describe a crappy tune. Last edited by Banzai-Racing; 07-12-18 at 07:08 AM. Ok gentlemen, I’m willing to go with a retune to see if that helps at all. In case my tuner won’t (turned me away after compression test due to liability concerns), does anyone know any reputable Adaptronic tuners? Call Steve Kan @ PRT Performance in Ft. Worth. He'll steer you right. Don't just go out and get a re-tune as you might just be wasting money. Nobody is saying that the shop you've gone to is steering you wrong just that you should have it double checked before you axe the engine. Alright gentleman I am reviving this thread instead of making a new one. I have a question. Would you trust this engine to run properly on a single turbo kit? I have the EFR 8374, install kit from Turblown, and I'm going with the IR Performance Competition Fuel System. The builder that's closest to me has had my friends car for 3 months doing a simple engine rebuild and I'm not willing to wait that long. Its been running fine since the tune and I have no reason to believe it wouldn't but I just wanted to get you guys (and gals) opinions before I proceeded to install everything. No. You never confirmed whether the compression test was valid or not. The engine was recently rebuilt by the previous owner and the compression #s are low across all rotor faces with symptoms of poor compression (hard to hot re-start, poor low rpm power, runs very rich). It is possible the previous owner had the engine rebuilt with aftermarket apex seals and they have destroyed the rotor housings in short order as they do leading to poor compression. hot start is very easy to tune since you shut the car off and try to restart it- cold start is much harder to tune since you get one shot a day and it is further from the base warmed up tune. If it starts fine cold and has trouble on hot start it is unlikely someone spent the time to get the cold start tune spot on and didn't spend time on the easier hot start tune. If you ask the previous owner for information in a non-accusatory manner he will likely give you more information so you can make an informed decision. Let the previous owner know you realize you bought the car as is, he owes you nothing and you want to get it running as well as you can- but could use more information. Can you? Sure, no problem. Should you? I don't think I would. It's good to have a solid foundation to build upon. If the builder near by you is busy, I would pull the engine yourself or have a mechanic you trust do it. Strip it to the short block and send the short block off to get rebuilt. Or, buy a ready-to-go motor, pull yours, swap everything over, put it back in. You have tons of options and all up and down the price range. Do some research and see what's right for you and your budget. Since I started the thread, I have had the car tuned and it runs a lot better than it did before. The fuel map was reworked and we street tuned it for substantially better gas milage on my long road trips. I no longer have as many problems with stalling and on cold starts it fires up within seconds. However, the hot starts are now my only area of concern. 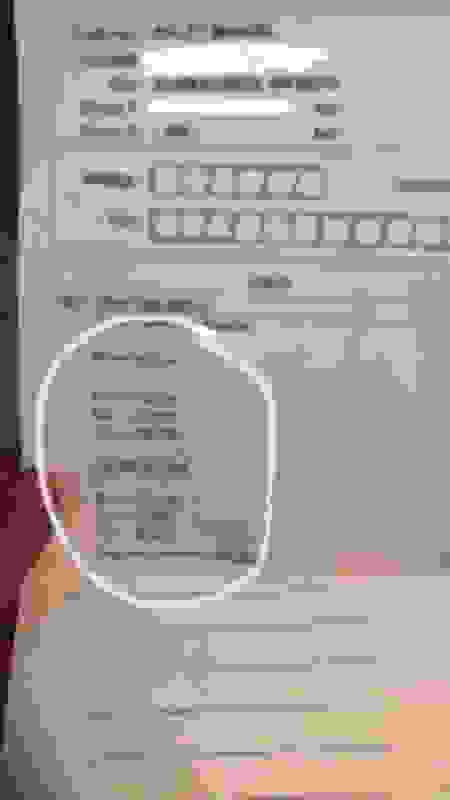 The reason I came back to this post is because of the compression. You know, a lot of times we as people make decisions, but we want to verify with others in the know that we are making the right one. I think its an excellent idea to start from scratch while I can so I can get the most life out of this build. So, rebuild it is. Thanks for all your responses fellas, it means a lot to me! IMHO may be worth getting a good short block from a good engine builder then get some buddies to come over and help swap it out one weekend. That way you can drive the car around until you're ready to go for it. good news & got the bad news..